The Legends series is all about team ups, some of them make sense like Optimus Prime & Roller, and other team ups don't make much sense at all. Starscream and Waspinator make sense since, besides the fact they know each other rather intimately. One has the immortal spark, and the other seems to have the indestructible body. The prefect grounds for the prefect team, covering each other's weakness. I'll let these two explain why they chose to their team up. Waspinator fed up of being Predacon! Antbot and Two Head blow Waspinator up when Waspinator tell them Waspinator done being evil! Poor Waspinator can't go one week without being blown to scrap! Even with new name on Cybertron, Waspinator looses in the end. Why universe hate Waspinator? Then Waspinator remember one of few victories, yes, Waspinator team up with Starbot, become invincible yes! No more parts for Catbot, or Ratbot to collect! 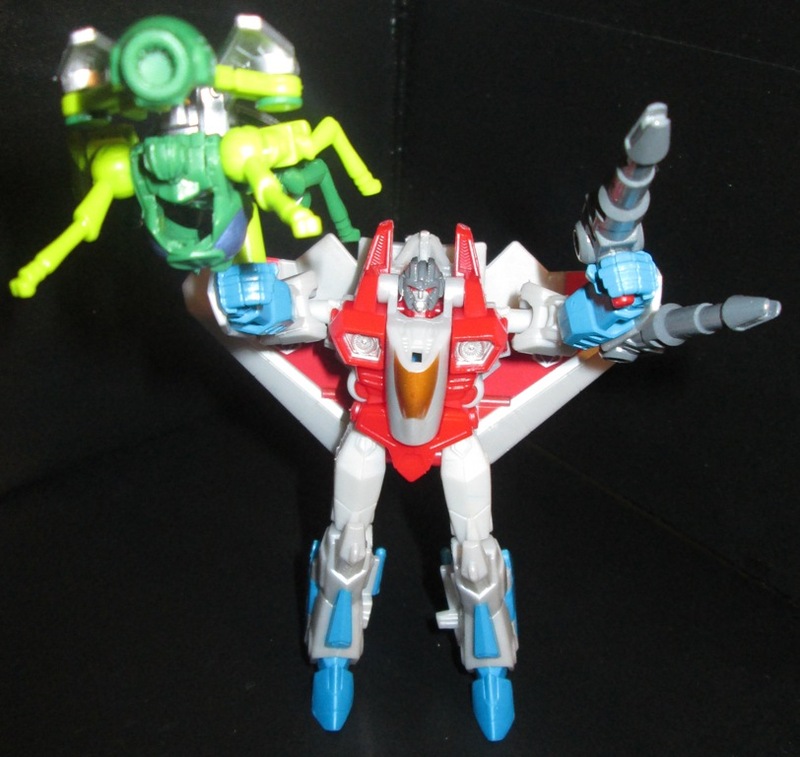 Waspinator will rule with Starbot! Starbot be brains, and Waspinator be the muscle yo! There were only two reasons why I couldn't take over the Decepticons. The first was because I lacked the loyal man power I needed to get the job done. The other reason was because I didn't crush the very spark out of Megatron when I had the chance! Let that be a lesson to you, mercy is a weakness. Megatron might be physically invincible, but his sole weakness is that he believes if it cannot destroy him, it is no threat to him. I will show him that if you don't kill it utterly, it will kill you in the end. Even with my failures, I have had my moments of near of near victory. I had the Combaticons, I had the aftermath of the battle of Autobot City in 2005. In some ways the battle of 2005 and subsequent events lead me to my newest ally. With Waspinator at my side I can fulfill my plans of victory and glory with him. He's the perfect fall guy who will follow my instructions until the very end, and then once he's blow up, he will keep on going because he is physically indestructible. 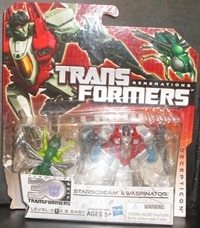 The box biography reads as follow, "Though they have never fought side by side, Starscream and Waspinator are intimately familiar with one another. Long After his time had passed, Starscream returned to the cybernetic half-life by possessing the body of the smaller robot. In the guise of Waspinator, the Decepticon Air Command nearly completed the betrayal of Megatron he had long contemplated." The only problem I have with the biography is on day #1 of Transformers, Starscream was trying to destroy Megatron and take over the Decepticons. 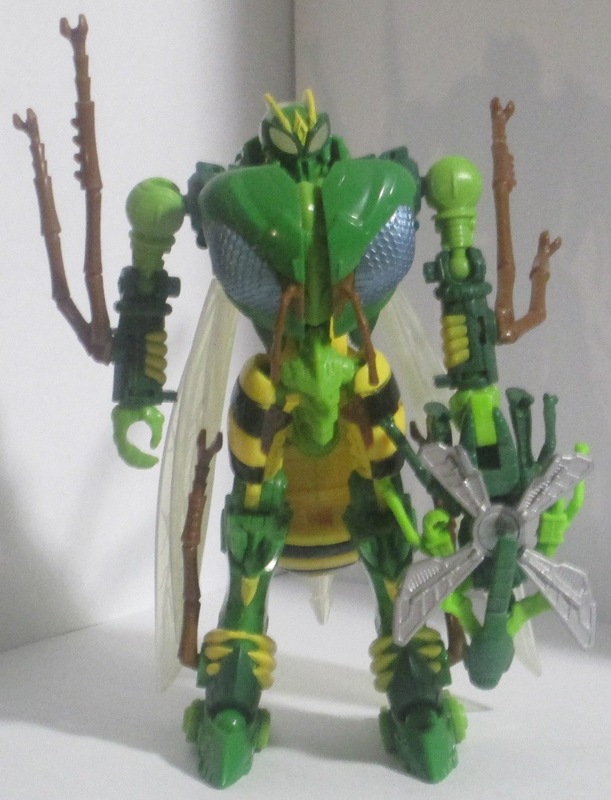 It also doesn't really give you a sense of Waspinator and his problems. Waspinator comes out of the box in his alternative form, he's a wasp. Funny thing here, after a little research, I found out that Waspinator is actually wait for it, a Cuckoo wasp. I kid you not, there are actually wasps out there which are colored like Waspinator. I don't know about you, but I was surprised to find that out. Waspinator doesn't have any points of articulation in this form. He balances nicely on his legs. The only real downside I see with these legs is they're small, and I can see a toddler being tempted to chew them off. His wings really don't move, mind you they have some nice artwork done into them. The two negative points he has is that his robot legs and 5 MM handle to stick out like sore thumbs. Lower Waspinator's wasp head, lower the 5 MM handle in the same direction, and then press the wings together that will extend the gun barrel, which was hidden behind Waspinator's wasp head. Hey Waspinator is now a gun, wasn't that easy? Like countless other weapon Transformers in the Legends series, Waspinator has the typical 5 MM port, so countless bots can hold him. However here is the real kicker, he fits in the hand of the Deluxe sized Waspinator, so Waspinator can hold Waspinator, this falls under the so evil/cute/unreal part of life. All kidding aside, he looks decent in this form. He has a clearly defined barrel; I can see a Transformer using the closed wings as a sight. The only beef I have with this form is a missed opportunity. Since you can move Waspinator's barrel about 45 degree's to the left, due to a piece of plastic you can't do the same for the right, which would make him a better "smart" weapon. Let's return the wings to their previous place, flip the 5 mm handle 180 degrees, flip the hands up 90 degrees, and can I hear you say, "Waspinator terrorize!" Given Waspinator's rather diminutive size, a mere, 1 and 3/4ths of an inch, you can't expect much of him in robot form. In the past I've noted how sometimes looking at these robot faces are like looking at bricks, with little bits of color here and there. Hasbro certainly delivers with a clear robot head that looks like Waspinator's head. Trust me you need sharp eyes to see the bug like eyes, the mandibles that go back and forth when he talks Beast Wars, it left me deeply impressed the fact they took a head that usually fits on a Deluxe sized figure on one this small. Like all the small bots like this Waspinator doesn't have much in the way of articulation of moving his arms and legs. His arms have maybe 100-110 degrees range of motion, normally they'd have more, but his bug arms hit his wasp wings which cuts short the range of motion that would normally be possible. While his legs can do about the same range, except they seem to be connected so having one leg up high and one down low really doesn't work out. However thanks to his thorax he can actually balance on one leg. As anyone who grew up in the 80s with Transformers remembers we had to use our imagination a bit when it came time to look at the robot we saw on the screen, or comic books, and then in our little hands. Starscream clearly fixes that problem with his most recent incarnation, however given how he stands in at 4 inches, well there are going to be differences between perfection and what is. I could list off the errors, but where is the fun in that? Instead I'll let you find them all. What he lacks in perfection, he makes up for in detail. He isn't some little hunk of plastic that vaguely resembles Starscream, instead we have 4 inches of plastic that looks the look, and walks the walk of Starscream. I swear all he's missing is a smirk to give you that sense that no matter the odds, he's going to win. Starscream has ball joints in his shoulders, elbows and hips which means yes he can clearly move around quite a bit. Given how his null cannons are detachable, it means he can hold them, or Waspinator can hold them also. It also means if Starscream is in a jam, he can shoot himself in the foot (a la Transformers The Movie) to escape impending doom. Aren't ball joints and detachable weapons fun? All those ball joints means that Starscream can take allot of poses, and for the most part none of his ball joints are loose, but in every gem there are flaws. Starscream has two noticeable ones that do cause him problems. See those nice huge wings in the back? Well given their weight, they sometimes cause him to fall over. The second are his feet, now there are only so many ways you can turn jet engines to feet, and here they split them into the blue front and the gray back. Only one problem, the two halfs aren't the same size, so they aren't the most stable feet out there. You might have to play with him (pardon the pun) to hold a position sometimes. Kids who love to play with him won't notice these flaws naturally. Let's transform Starscream from Robot to Jet. Return the null cannons to his arms, and straighten out his arms so they are reaching towards his feet. You'll want to flip the wings down before you close up the legs, and then close up the feet. You'll want to pull his arms down towards the feet, as a note this is a bit hard because the ball joint does tend to pop here. You will find holes in his arms that fit into plugs in the jet to really lock them into place. Flip the null cannons forward away from his jet engines. To close him up you'll want to flip out the jet's nose which is stored under his head, just like the original. What do we have here; well Starscream underwent a little change besides his size. He's now his own type of jet, a hybrid F-15/F-22. I guess you won't be seeing him at any air shows any time soon. However unless someone gives him a close look, odds are he can still sneak by those pesky humans in his disguise. Let's tear him down so to speak. As a big safety *warning* Starscream doesn't have a rubber jet nose. I.E Yes it can hurt people if you poke people with it. I've got to give Hasbro their dues, since besides the nose wheel, they did include a pair of wheels in the back for when Starscream is landing and taking off. It's a level of detail they sometimes used to skip. Guess like most things Hasbro is improving with age. I understand from a traditional stand point how Starscream has to be gray, red, and blue. My problem is when I look at it, the gray looks flat so to speak on his top side, and the fact they use one shade of red near his cockpit and another on his wings doesn't look that great. A brighter shade of red would've made Starscream seem more alive as a jet. Clearly given how Starscream is so small, he has a painted on cockpit. I've really got mixed feelings on Starscream as a jet. If I took away the colors, I'd say he looks great. There isn't a lot of stuff I see on either side that no one really wants to see like pins, screws, and hollow spaces. He even has a nice hole in the lower end for Waspinator. However, I can't help but look at this paint job and feel a do-over wouldn't hurt him. Transformer Design 9/10: Hasbro rates these two as easy, and given how I was able to figure out how they transform without glancing at the manual, I am inclined to agree with them. I could see a child as young as 4-5 years old being able to transformer either one of them. Durability 6/10: Starscream has one major flaw, the ball joints for his arms aren't really tight enough to complete the transformation without being torn off, which is a big problem. Then you have Waspinator where I feel that those legs just scream "chew me" to a toddler. Fun 8/10: If you know the story line these two have, they're great. If you are a kid, well what isn't cooler than a jet, and a bug who work together to crush those who you want to crush? Aesthetics 8/10: With the exception of a flat paint job in vehicle mode, and being based on a jet that has never flown, Starscream looks great. If this one was on store shelves in the 80s, he'd be gone once they were there despite there being a larger version of him. 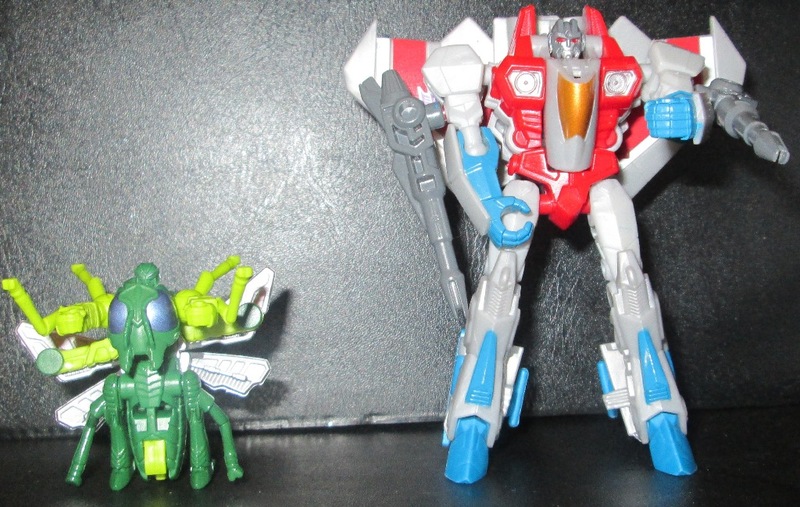 Articulation 8/10: Both Starscream and Waspinator bring nothing special to the table articulation wise. However, they both get the job done. Value 7/10: For fans of either or both these characters, this combo is priceless. What I feel they lack to go from good to great is the fact there isn't a hidden way for them to interact. For the record I paid $9.99 USD for them. Overall 7.5/10: I am always amazed by the quality work the Legends size figures bring to the table. They are fun to play with, usually decently built, as a parent these are great intro toys to see if kids like Transformers. 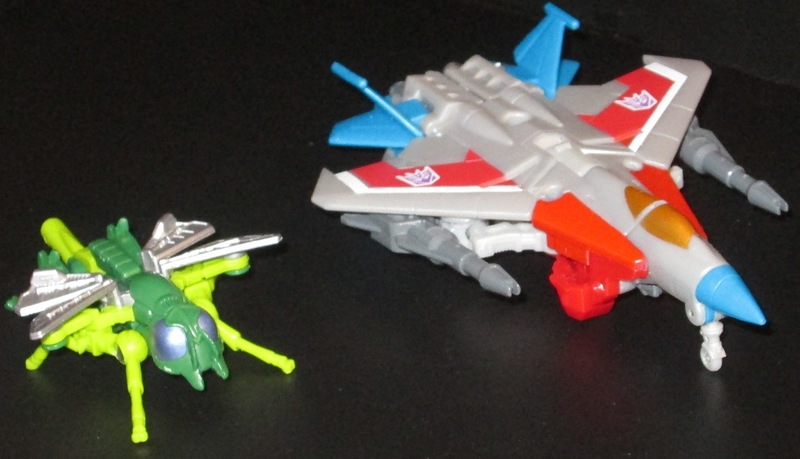 I wish all the team ups Hasbro offered were as great as Starscream & Waspinator.